Quiet and pretty village location. Friendly hosts serving local produce. 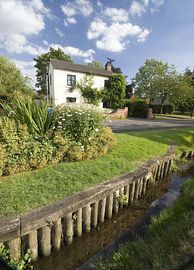 Come and stay in our period cottage on the village green with its brook and resident ducks at the heart of the National Forest. Within easy reach of A38, and M42; also convenient for Burton on Trent, Lichfield, Ashby de la Zouch, Tamworth and within 30 minutes of East Midlands and Birmingham airports. All rooms are well appointed with very comfy beds (one being a water/mud bed), ensuite or private bathroom, hospitality tray, TV with freeview, CD/DVD, hairdryer & free wireless internet access. Nearby attractions include: Catton Hall, The National Memorial Arboretum (near Alrewas), Calke Abbey (NT), Garlands Shooting Grounds, Rosliston Forestry Centre, Conkers, Tutbury Castle, Drayton Manor Park, Tamworth Snowdome, Twycross Zoo, Castle Donington Race Track and Mallory Park. Also within easy reach are, Alton Towers, Uttoxeter Races and Sudbury Hall (NT) Shugborough Hall, The Potteries (Stoke on Trent) and Denby visitor centre, Cannock Chase and The Peak District. We cook local outdoor reared pork sausages & dry-cured bacon from local butcher Peter Coates & Son of Alrewas. Our eggs are free-range, sourced locally, they are happy hens that are free to roam around outside - the yolks are a beautiful dark yellow colour and they taste divine! They can be boiled, poached, fried or scrambled with cream and fresh chives Put this with fresh tomatoes & field mushrooms, healthy fried bread and other things from time to time. Apart from the traditional English items we serve fresh fruit salad, fresh grapefruits, organic milk, yoghurt, wholemeal bread, porridge with maple syrup, home made muesli, home made marmalade and preserves and quality cereals. We also serve fresh fruit-juice (no long-life stuff here! ), cafetierre coffee, lots of different teas and seasonal produce from our own garden such as fresh baked rhubarb, stewed fruits and other seasonal items. You can eat as little or as much as you like & we can cater for early or late leisurely breakfasts to suit. For people in a hurry, please enquire about our pre-ordered breakfasts so you can get away quickly in the morning. The Green room is complete with en-suite wet room and double water/mud bed. Don't worry the water-bed is not one of the old fashioned ones you slop about in, this one is one of the very latest & is much more firmer because they have baffles inside (which makes it more like mud than water ..). It is also heated & we can personally recommend it! This room looks out across the very pretty village green where you can often see the ducks wondering around. The Blue room is situated at the back of the house & overlooks the garden, you can also see the village green. This room has a good size separate bathroom (with bath & shower) for your sole use. It is a very quiet room equipped with a fantastically comfortable Dunlopillo bed with Latex mattress (anti-allergy type). This bed can be made up as a king size double or split into two singles (it has a clever zipped mattress). 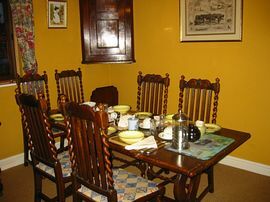 Both rooms use top of the range Dorma Bedding, have antique furniture, a combined TV/DVD/CD player with Freeview, free WIFI and you have a hospitality tray including tea, coffee, hot chocolate and fresh milk (no plastic cartons here!). 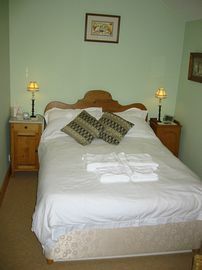 Double/twin occupancy rooms: £65.00 for 2 people. Hospitality tray and WiFi all included for free. Pet Facilities: Pets are allowed. By prior arrangement only please. Smoking Facilities: Smoking is allowed. Outside the property. Special Diets Provision: Special diets are catered for. Please let us know your requirements at the time of booking. Disabled Facilities: There are disabled facilities. Disabled visitors are welcome, but bedrooms on the first floor are not wheelchair accessible. Assistance can be provided. "Very comfortable, great hospitality and a breakfast worthy of a first class hotel." Exit at junction 11 and follow the A444 towards Burton On Trent. After a few miles turn left after the Crickets pub. At the end of the road turn right, then immediately left (staggered junction). Follow straight on at the next junction continuing all the way to Coton in the Elms (signed). 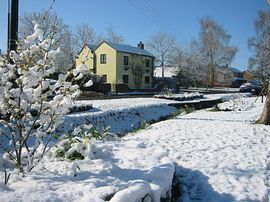 Turn left at the Queens Head public house and Fern Cottage is on the left opposite the brook/green. Exit at the Alrewas/A513 junction & take the A513 towards Tamworth, after 1 mile you go under a railway bridge, turn left just after it. Follow past Catton Hall (stately home) & take the next right (on the sharp corner). Follow for a couple of miles until you reach the crossroads, turn left and continue into the village. Turn left at the bottom of the hill (by the telephone box), then bear right when the road forks. We are on the right opposite the brook/green.